Still looking like the lean-muscled cyclist you’d expect to do it for a living, Timmreck says he’s now down to bike deliveries one day a week. The other four days he drives a van, delivering to the suburbs. And while he’s “generally more happy on a bike,” five days a week in the saddle got to be a lot of work, he says. Perhaps it had something to do with the fact that Minnesota winters are especially cruel with their minus-zero temperatures and propensity for lingering snow. Nor is the record heat and humidity the city is experiencing this summer conducive to comfortable cycling. Not being in a car “with walls around you” was the fun part; making deliveries in downtown Minneapolis traffic was not. Although there are designated bike lanes for most of the downtown area, not all streets have designated lanes, nor do all drivers graciously share the road. Finding experienced bike delivery employees has become easier since the onset of third-party delivery, which sometimes includes bikes in the car pool. Peace Coffee’s production manager, Sara Lidstrom, isn’t looking for recreational riders. “I look for year-round cyclists who view it as utilitarian,” she says. In other words, not someone who takes their bike out on long rides on the weekend, but someone, like Timmreck who views it as his primary mode of transportation. About 75 percent of the 56 employees ride their bikes to work, says Lee Wallace, CEO and Queen Bean of the socially conscious coffee company that prides itself on being one of the first to develop a relationship and fair pricing program with coffee farmers. “(Bike) delivery is part of our DNA,” she says. They are now in the process of buying new bright red carts that become rolling billboards for the company, which sells to outlets such as restaurants and coffee shops, co-ops, grocery stores and also its three own coffee shops. Bike delivery became their primary means of delivery back when the company was established in 1996. “We were a scrappy little company that couldn’t afford a delivery van,” Wallace says. At the end of their shift, employees would load up their backpacks with packaged coffee and drop them off to customers on their way home. 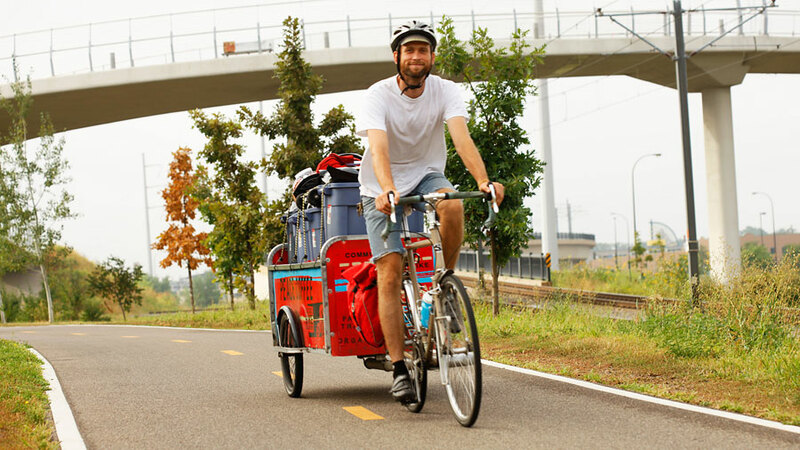 They now employ 2.5 bike delivery couriers, who deliver about 50 percent of the company’s coffee. Insurance is not a problem, in fact they have more scrapes and scratches with the vans than the bikers, Wallace says. “Our workers comp considers them to be regular employees,” she says, adding wearing a helmet is mandatory. To save couriers’ legs, the schedule is now three days on the bike, two days in the van or in the production plant. “We want it to be a sustainable job,” Wallace says. Couriers use their own bikes and Peace Coffee pays for maintenance. Not only do they prefer to ride their own bikes, Lidstrom says, it would too difficult to maintain a fleet of bikes since not all bike riders are the same height nor like the same type of seat. And like most things in life, it’s best when you have the wind at your back. “If you have the wind at your back, you have a sail,” he says of the cart. Uphill? We won’t go there.